Rival parties on Tuesday clashed over a visit by the presidential chief of staff to the Demilitarized Zone at the border with North Korea while President Moon Jae-in was on a visit to Europe last month. In the midst of Moon's nine-day trip to Europe, Presidential Chief of Staff Im Jong-seok visited the DMZ on Oct. 17 to take a first-hand look at mine-removing operations that the two Koreas were undertaking. Lim is serving as the head of the presidential committee in charge of enforcing inter-Korean summit agreements, which includes the demining operations at the border. 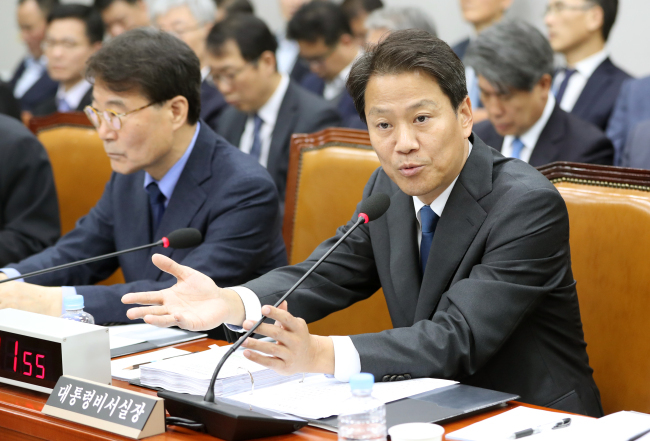 During a parliamentary audit of the presidential office Cheong Wa Dae and its national security office, the main opposition Liberty Korea Party slammed Lim for what it called acting like the president inspecting the zone. "When the president is abroad, how could the minister and vice minister of defense, the unification minister and the spy chief visit the DMZ en masse?" said Rep. Sung Il-jong of the LKP. Sung also raised questions about Lim's alleged mishandling of military secrets over the presidential office's release of footage that inadvertently leaked the location of an entrance to a South Korea guard post during Lim's DMZ trip. The ruling Democratic Party defended Lim, saying that his trip was a necessary part of the government's efforts to bring peace to the Korean Peninsula. South and North Korea earlier agreed to conduct a joint project to retrieve war remains from the site between April and October next year. "I don't understand why my visit was problematic. I went there on the committee's judgment that it is the site for the project to retrieve war remains, a key element in the inter-Korean agreement," Lim said.